Sherwood Dental is dentistry for people who love to smile, and not only do we create smiles patients are proud to show off, but our patients’ experiences at our office are also worth smiling about. Drs. Stephen Gaines and Arti Patel and the friendly team offer advanced technologies and techniques that promote comfort. 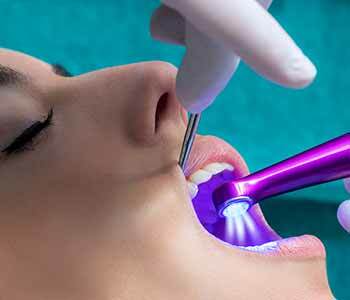 Laser Dental Treatment in Oakville ON is a perfect complement for this approach, because lasers eliminate many of the concerns that patients have traditionally had about dentistry. Laser technology eliminates the need for the drill, needle, numbing medications, and sedation. It provides a gentle treatment that patients tolerate very well, but without the need for pain control or other medications. These instruments have been used in the dental world since the 1990s. They are considered to be a minimally invasive alternative to conventional instruments, such as dental drills, scalpels, and needles. Less invasive procedures are often associated with fewer side effects, such as less bleeding, swelling, and sensitivity. When there is less to recover from, downtime and demands on your body for healing are also reduced. In addition, lasers promote the body’s own healthy healing and tissue regeneration. Since the laser beam is pinpointed exactly to trouble areas, healthy tissues remain intact, and natural structure is preserved. As with applications in other branches of medicine, laser dentistry is largely divided into two categories: diagnostic and treatment. A small sample of tissue may be gently and safely removed for biopsy to check for the presence of cancer cells. Laser devices help to aid in the accurate identification of hardened plaque or tartar on the tooth surfaces above and below gum tissues. The technology treats a number of diagnosed conditions and even addresses cosmetic needs. In-office tooth bleaching is so fast because the whitening ingredients are light-activated by the laser. The pain of canker and cold sores may be relieved with laser instruments, and gums may be reshaped and bacteria removed to treat gum disease. This approach is considered to be less invasive and better-tolerated that traditional incisional surgery and may be recommended if traditional scaling and root planing hasn’t achieved good results. Lasers can also treat damaged hard tissues. For example, a tooth that is decayed can be repaired with devices that remove the bacteria and debris responsible for the decay. The technology is also used to prepare teeth for treatment, such as teeth with cavities for fillings and infected pulp tissue for root canal therapy. There are more ways to use lasers in dentistry than ever before for the comfortable and precise treatment of both hard and soft tissues. Sherwood Dental is pleased to offer the Waterlase system. The phrase “natural water-powered dentistry” sums up this therapy, which combines the laser with water via a continuous spray. Since teeth are partially made up of water, when Waterlase comes into contact with the tooth, those water molecules get excited and cut through the tooth – no drill or scalpel required. Water also helps to keep the treatment area hydrated, so patients don’t feel the laser at all! Even our youngest patients love it. As the tooth is hydrated throughout, Waterlase safely controls the heat that is produced during treatment for utmost comfort and a low-risk procedure. Drs. Gaines and Patel and the entire Sherwood Dental team encourage you to get to know modern dentistry. Contact us to schedule an appointment and to benefit from lasers and our other advanced and gentle tools and techniques, available at our convenient office on South Sheridan Way in Oakville.